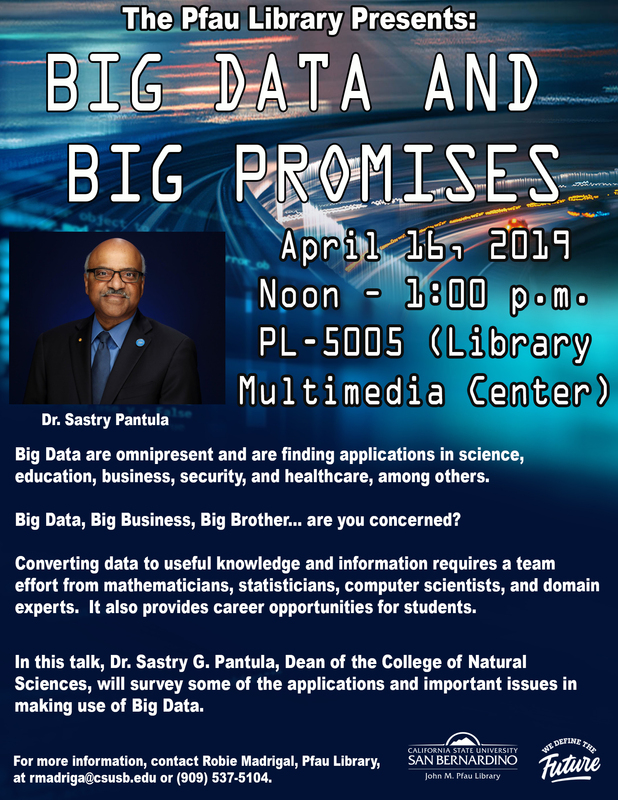 “Big Data and Big Promises,” by Sastry G. Pantula, dean of the College of Natural Sciences, is scheduled noon in the John M. Pfau Library multimedia center, PL 5005. Sastry G. Pantula, dean of the College of Natural Sciences at Cal State San Bernardino, will host a talk focusing on Big Data – massive volumes of both structured and unstructured data that is so large it is difficult to process using traditional database and software techniques. “Big Data and Big Promises” is scheduled for April 16, from noon-1 p.m. in the John M. Pfau Library multimedia center, PL 5005. The program is free and open to the public. Parking on campus is $6. Big data is changing the way in which key industries operate, leading to new levels of efficiency and progress. In the health care field, for example, big data is enhancing patient care by helping to diagnose diseases in their earliest stages, when treatment is usually most effective – and often less costly. While big data has broad-ranging potential for improving humanity’s condition, concerns exist about privacy and the security of large amounts of data, such as personal medical records – one the most sensitive types of information collected. To protect privacy and secure information, experts caution, robust safeguards must be built into data-storing systems. Most recently, Pantula served as director of data analytics programs at Oregon State University (OSU). He also served as dean of the College of Science at OSU from August 2013 to August 2017, after a three-year term as director for the Division of Mathematical Sciences at the National Science Foundation. Pantula spent more than 30 years as a statistics professor at North Carolina State University (NCSU), where he began his academic career in 1982. At NCSU, he also served as director of graduate programs (1994-2002) and head of the department of statistics (2002-2010). For more information, contact Robie Madrigal of the Pfau Library, at rmadriga@csusb.edu or (909) 537-5104.